01. A business analyst (BA) is working to identify pain points on decentralized software maintenance and license contract management process. Four major stakeholders are involved in this process. The stakeholders are unclear about who is doing what and what is expected to be done. What should the BA do to delineate the stakeholders’ roles? 03. A regulatory agency recently changed the record retention requirements for financial services providers. All financial reports must be retained in electronic format both on production reporting servers and in an off-site data repository. What output will the business analyst need to manage the requirements impacted by this regulatory change? 05. 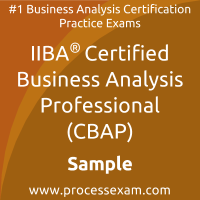 A business analyst (BA) is defining a business analysis approach that should be compatible with the other project activities. Assessing the new solution's limitations should be planned as well. When should this this activity be performed? 07. A business analyst (BA) meets with a long-tenured vice president who expresses disagreement with the objectives of the project on which the BA is currently engaged. In what way does the vice president impact the BA's next step? a) The vice president's high level of influence will cause the BA to leverage the organizational modelling technique. b) The vice president's decision making authority will cause the BA to develop a new stakeholder engagement approach. c) The vice president's negative attitude towards the project will cause the BA to leverage the risks analysis and management technique. d) The vice president's disagreement with the project's objectives will cause the BA to leverage the stakeholder list, map, or personas technique. 08. An organization maintains a central repository for managing new products that are brought into the organization. This central repository was built over a decade ago, initially starting in a spreadsheet, then moved to various iterations of a custom solution built in house. There are many pitfalls in the current implementation and it does not have clear set of baseline requirements. The organization wants to improve the process. A business analyst (BA) is tasked to start the requirement elicitation. Which of the following should the BA do?